Siesta Shores #10 - 1 Bed / 1 Bath Beach Cottage with Location, Location, Location! Located in one of the most desirable locations, with spectacular St. Armand’s Circle just a stone's throw away; also the coveted crystal white sand of Lido Beach, with its translucent waters and world class shelling. The residence is situated on a spacious 16,000 square-foot lot overlooking the Pansy Bayou canal providing access to the Gulf of Mexico. 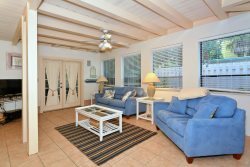 This incredible home includes 4 bedrooms, 3 full baths and everything you need for a fabulous stay on Lido Key. Original, Polished Terrazzo floors flow throughout the main living area. Architecturally pleasing with rounded walls of windows. The family room boasts an 11 foot high vaulted ceiling with sliding doors to reveal a wide panorama of the canal. You will enjoy the well equipped kitchen which is perfectly situated for entertaining with easy access to the formal dining room seating 6, and family room. The outdoor living space is abundant, with an oversized lanai, large covered patio for enjoying your morning coffee or meals outdoors. A large refreshing pool and spa (pool not heated) for your enjoyment anytime of the day or night. There is a dock on the canal for fishing or just enjoying the wildlife and beautiful water views. Perfectly located - just a one minute walk from the world renowned restaurants, art galleries, coffee shops, ice cream shops, and clothing boutiques of St. Armand’s Circle; yet the large lot provides your own private world! Boat to Marina Jack,and the downtown Sarasota theater district as well. You will find everything you need in this well equipped home: Wifi, beach chairs, umbrellas and a convenient cart to carry the necessities for a day at the beach. A two car attached garage is available for your convenience and for additional storage. Very attentive to our questions and easy to contact. Our second time to rent the house. Very enjoyable! The house exceeded our expectations. The location....a block from Lido Beach and St. Armands Circle....was perfect. We will surely be back! Very helpful and even let us check in early. They made check-in and check-out easy! The house was in a perfect location! 2 minute walk to beach and in opposite direction 2 min walk to St.Armands. It was well maintained and spotless. I was a little nervous renting this house because it was so reasonable for a 4 bedroom house in such a great location. You would not regret staying here! Will try for it the next time we are in area! Great house and location. Love the pool and had manatees in the water in the back of the house. Short walk to beach one way and short walk bars/restaurants/shopping the other way. Would definitely rent again.